Swiss Watch Manufacturer Alpina Genève is excited to launch its new Startimer Pilot Collection; a highly attractive range of contemporary timepieces, inspired by original Alpina designs from the 1920s and 30s. During two decades, Alpina Watch International was known as a specialized manufacturer and official supplier of military watches, utilized by pilots. These early aviation pioneers had strict requirements: their instruments had to be extremely precise and provide ultimate shock resistance. In addition, Alpina pilot’s watches were mostly equipped with an anti-magnetic case, a high-contrast dial with oversized luminous numerals and luminous hands for instant readability. 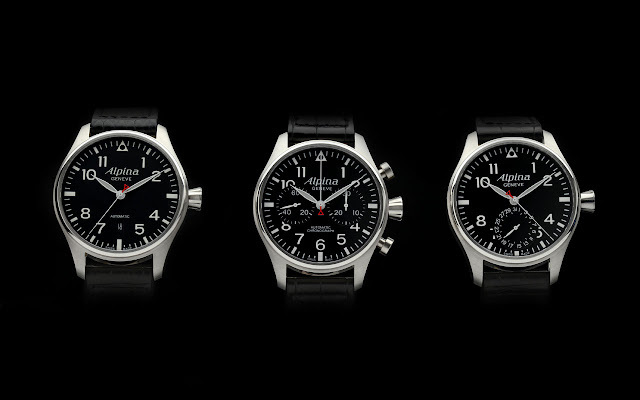 Today, almost a century later and after having revisited its rich aviation heritage, Alpina introduces the new Startimer Pilot Collection, offering four exciting variations. It kicks off with a basic three-hand date automatic (cal. AL-525). Next in line is the timepiece with in-house developed and produced automatic caliber AL-710, featuring minute and hour indication and off-center date hand. In-house caliber AL-950 powers the iconic Startimer Pilot Regulator, combining historic pilot watch design features with a modern day regulator lay out. Last but not least, a well-balanced and powerfully designed automatic chronograph version (cal. AL-860) is part of this new range. 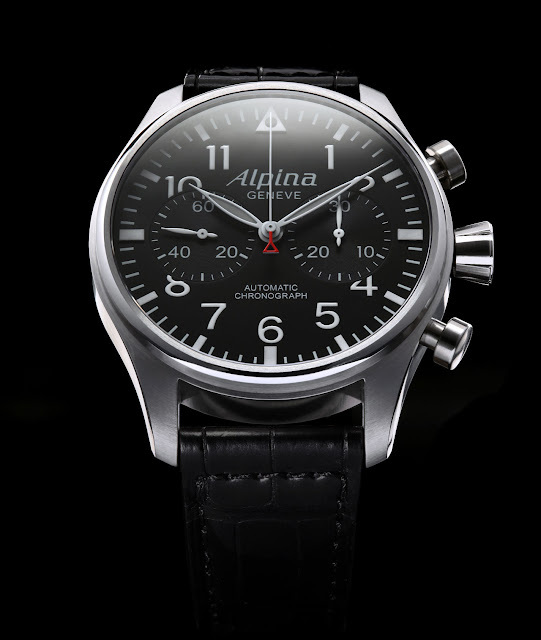 The clean design that connects these timepieces was clearly inspired by Alpina’s past: a generous 44 mm, anti-reflective satin-finished stainless steel case, mat black dial with oversized white luminous numerals, a glare-free sapphire crystal and a signature red Alpina-triangle on the second hand are the key features. 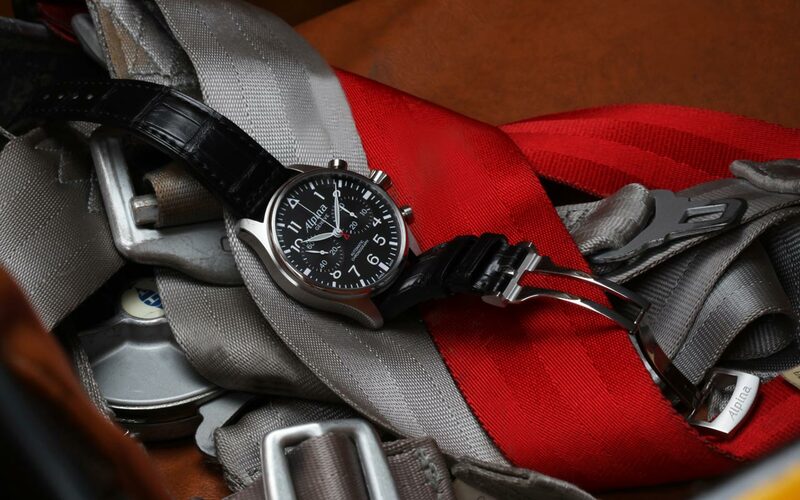 To further improve user-friendliness and comfort, an original solution was found to secure the leather strap: it closes on the front side of the wrist, not on the reverse or lower sides, hereby resembling the vintage leather straps of the past. A newly designed metal bracelet is available too, and fits on all versions. To support the launch of this important new collection, Alpina Genève proudly joins forces with Cessna Aviation and PrivatAir, signing a three-year agreement with both partners. During the coming three years, Alpina Geneve, Cessna Aviation and PrivatAir will work together closely to promote their equally high quality products and services, through cross-marketing activities in Europe and North America. Furthermore, the production of the Alpina Startimer Pilot timepieces will be limited at 8’888 pieces and they will be presented in a dedicated, luxurious packaging, alongside a Cessna Citation Mustang scale model in PrivatAir livery.